Alan Longmuir, who died last Monday aged 70, was bass guitarist with the Bay City Rollers, the Scottish pop group who, somewhat inexplicably, reduced more teeny-boppers to hysteria than any British band since the Beatles. Longmuir founded the group with his younger brother Derek in the 1960s while he was a teenage apprentice plumber, but it was not until the mid-1970s that they became chart-toppers, guided by their Svengali-like impresario Tam Paton. Paton repeatedly changed the line-up, and the Rollers would usually mime in concert, musical ability being a less important requirement than a capacity for looking winsome in tight jumpers and three-quarter-length flared trousers festooned with tartan accessories. Longmuir later claimed that he would "rip off all that garb and put on a pair of jeans" as soon as he was offstage, although sometimes the group's fans - known as the Tartan Horde - pre-empted him. "I've had the shirt, trousers, shoes and socks literally ripped off me by crowds of girls," he recalled in later life. "It could be bloody frightening." The pallid, wire-haired Rollers looked unglamorous compared with their American chart rivals the Osmonds, and their singing sounded at best like a plucky imitation of the Beach Boys' harmonies. They nevertheless enjoyed a run of nine Top 10 singles in the UK charts from 1974 to 1976, including Remember (Sha-La-La-La), Shang-a-Lang, Summerlove Sensation, I Only Wanna Be with You and the two No 1 hits Bye, Bye, Baby and Give a Little Love. In 1975 they had their own series on Granada Television, Shang-a-Lang, in imitation of The Monkees. 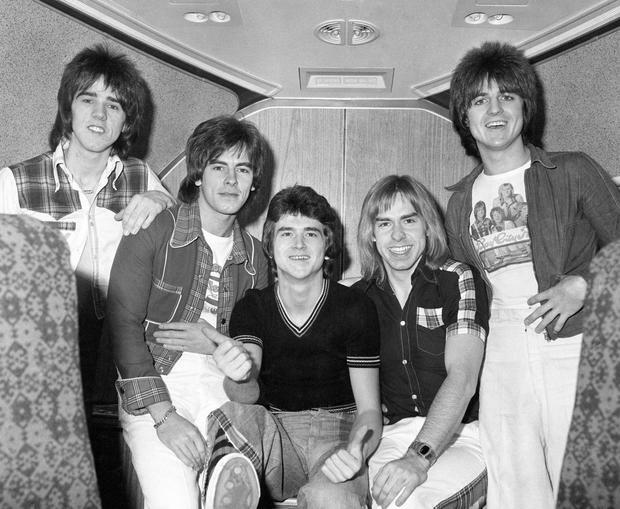 Long after the Bay City Rollers had been consigned to the dustbin of 1970s' naffness on this side of the Atlantic, their music remained popular in the United States and Japan, and they have sold more than 120m records worldwide. Yet although Longmuir rejoined the group several times over the years for reunion gigs, he was obliged to spend much of his middle age working as an inspector of drains or boilers to make ends meet, while engaged in legal action over money he thought he was owed from the Rollers' heyday. Alan Longmuir was born in Edinburgh on June 20, 1948, the son of an undertaker. He decided that he would become a rock-and-roll star after seeing Elvis Presley in Jailhouse Rock at the Scotia cinema in Dalry Road, and played in various bands with his brother Derek and their cousin, Neil Porteous, while he was training to be a plumber. Deciding that they wanted a name with a Motown feel they stuck a pin in a map of the United States and lit upon Bay City in Michigan, adding "Rollers" in homage to the Detroit Wheels. The Rollers had a No 9 hit in 1971 with Keep on Dancing but failed to gain momentum, so their label, Bell Records, hired the hitmaking songwriters Phil Coulter and Bill Martin to write for them. Within a few years they had burst into the big time, the line-up in their prime comprising Alan on bass and Derek on drums, with lead singer Les McKeown and guitarists Eric Faulkner and Stuart "Woody" Wood. In 1976, however, Longmuir left the band, feeling too old at 27 (he was obliged to pretend he was much younger) and depressed by the lack of privacy. The constant adulation bordered on the obsessive in some cases: one girl fan put cornflakes through his letterbox every morning to ensure that he would eat breakfast. There were reports that he had attempted suicide, though he later denied it. He retired to a smallholding in the town of Dollar, near Stirling, sang with an amateur country-and-western band and became engaged to a local girl. But he rejoined the Rollers in 1978, admitting he missed the buzz, and the relationship foundered. In 1981 he played the lead in an action movie, Burning Rubber, made in South Africa. By the time he married Jan, a pub manageress, in 1985, work in showbusiness had dried up. They ran a hotel together for a time, but divorced in 1990, Longmuir's heavy drinking being a factor. In 2000 it was reported that he had paid no upkeep for their son Jordon for more than a decade. He suffered a heart attack in 1991, aged 43, and a stroke five years later; in 2000 he was forced to withdraw from a Bay City Rollers reunion tour owing to further ill health. He was greatly helped in his recovery by his brother Derek, who had left the music industry and retrained as a nurse. Latterly the Rollers presented rather forlorn figures, dogged by reports of in-fighting and squabbles over money, as well as rumours that Tam Paton had exploited their fame to prey on vulnerable boys and men. But from 2015 they enjoyed a series of successful comeback gigs, the Daily Mail's Jan Moir noting that on stage Longmuir "looks like a retired plumber who can't quite believe his luck, which is exactly what he is... cranking out the hits with the slightly baffled air of a genial grandad". Alan Longmuir married secondly, in 1998, Eileen Rankin, a civil servant, who survives him with the son of his first marriage.